Looking for the ultimate vacation getaway? 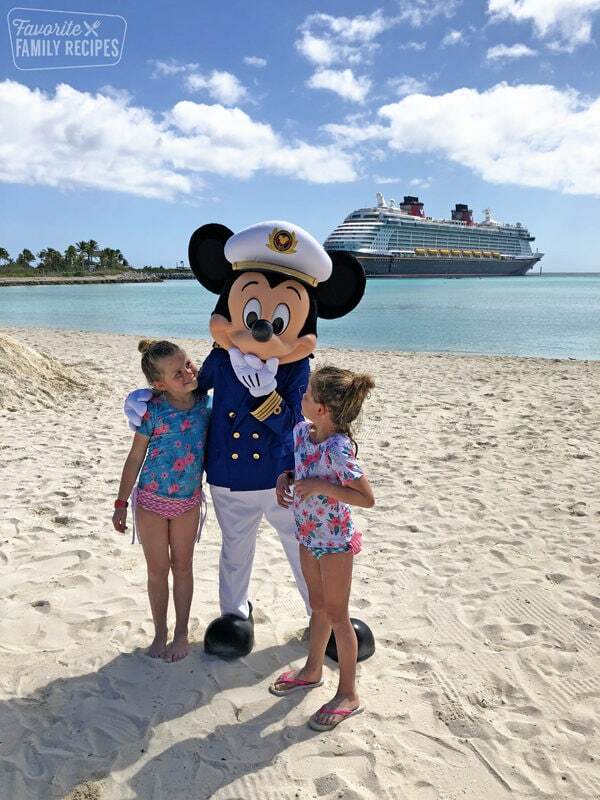 Look no further than the stunning beaches, lush landscapes and turquoise Bahamian waters of Disney’s own private island, Castaway Cay. 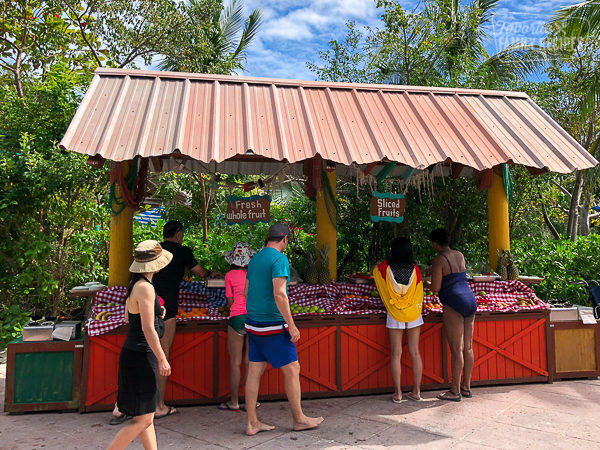 This exclusive island is a perk for guests taking a Disney cruise to the Bahamas and the Caribbean. Read on for some of our best “insider” tips to make your visit to this magical Disney island the pinnacle of your next vacation! Your “Key to the World” Cards– They will remind you many times before you get off the ship that you need your Key to the World Card but still, don’t forget it! Make sure you have every member of your party’s card with you before you even leave your room. This is the most important thing you will need. Sunscreen– And apply often! Don’t forget your kids if they are in the kid’s club at Scuttle’s Cove. You may have to go grab them and re-apply if you have them in there for longer than a couple hours. Something to tell the time– A watch, your phone.. anything where you can check the time throughout the day. You will need to know the time so you know when you can grab lunch, when your excursion starts, and what time to get back to the boat. A large(ish) water bottle– I usually always keep my re-usable water bottle with me whether I am on vacation or just at home. Yes, they have water and drinks on the island but the cups they provide are pretty small. It’s best to bring something that you can keep on the beach with you without having to go and refill all the time. Sunglasses– The white sand and clear water make for a lot of bright, reflective surfaces. Sunglasses are a must! A hat– Hats are always helpful just to keep that harsh sun off your face. Hats for the littles are a great idea, too. Waterproof Phone Pouch– No need to bring an expensive, waterproof phone case. You can get a phone pouch for around $5-$10 on Amazon and you will be so happy you have it. It works just as good, if not better than an actual waterproof case. You will most-likely be spending a lot of time in the water and you will want to be taking lots of pictures. 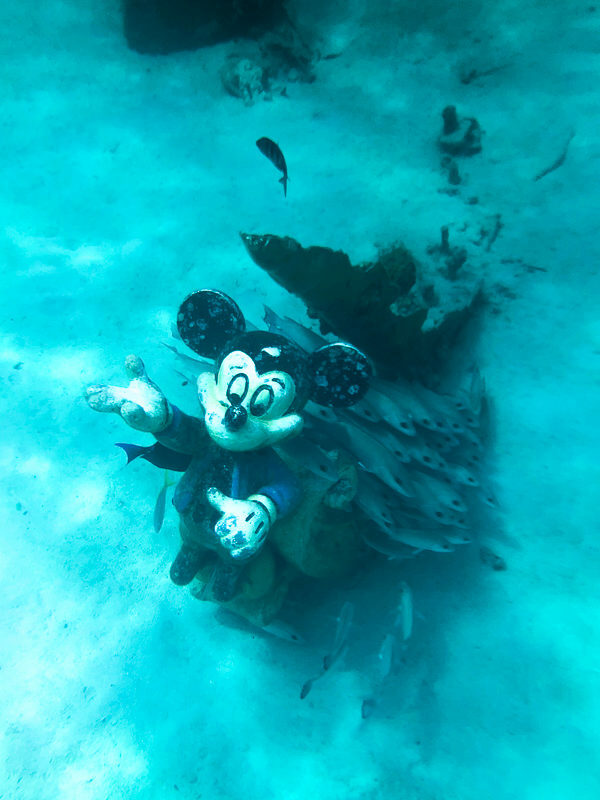 Plus if you go snorkeling you are going to want proof that you found the underwater Mickey statue! 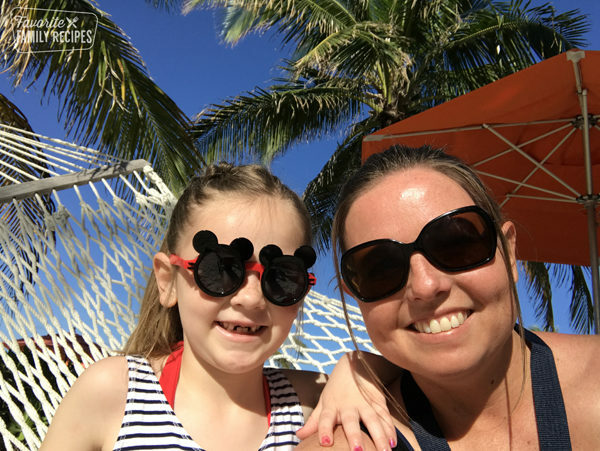 Goggles (for the kids)– The snorkeling on Castaway Cay is awesome and my kids LOVE it but when we are just chillin’ close to the beach they prefer just regular goggles. They can easily dive down and see all the little fishes swimming around without dealing with a large mask and snorkel. Comfortable sandals or flip flops– Keep in mind that you might be walking around a bit to get where you want to go. If you don’t want to wait for a tram and want to walk somewhere you are going to want slightly better footwear. Money- Don’t even bother bringing cash or cards onto the island. They don’t even accept them anywhere. Not even in the gift shops. The one (and only) place that accepts cash is the post office. If you decide to buy stamps there or mail a postcard, you will only need a small bill or two. Life Jackets- They have these all over the island in all different sizes. They will have you covered. If you think you will need life jackets for your kids, grab them early on in the day so you don’t have to go searching for them later. Strollers (or Wheelchairs)- Both strollers and wheelchairs are provided on Castaway Cay. You can get them at the tram stop and you are free to use them all over the island. They even have wheelchairs that you can use in the sand! Towels- You are provided towels as you disembark the ship. Don’t worry about bringing them back on, they have laundry bins right there on the island that you can toss them into so you don’t have to lug them back to the ship. 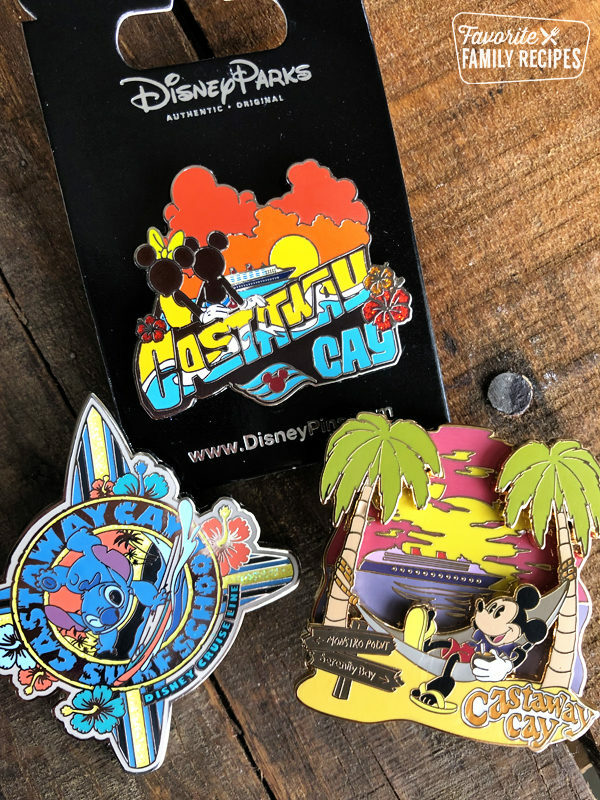 Disney trading pins- Though you can buy exclusive Castaway Cay pins on the island (more about that later), the cast members don’t actually do pin “trading”. Don’t bother bringing your pin collection to the island. They will just be dead weight. 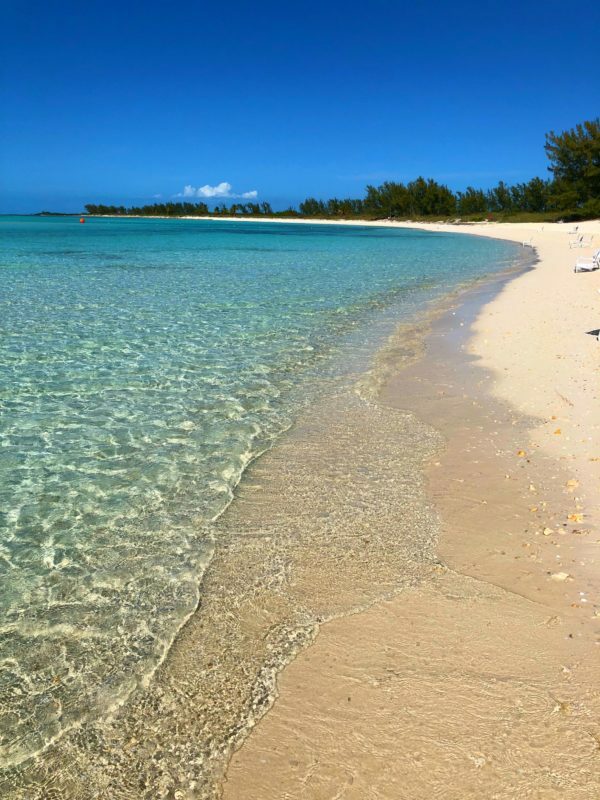 There is NO WiFi at Castaway Cay, making it the perfect place to unplug and truly escape. But, if you need to reach a member of your party, use the “wave phones” from the ship. You can call and text with them for FREE! Disney provides TWO wave phones per room but if you need more you can go down to guest services on the ship and they can give you more (for a small fee). 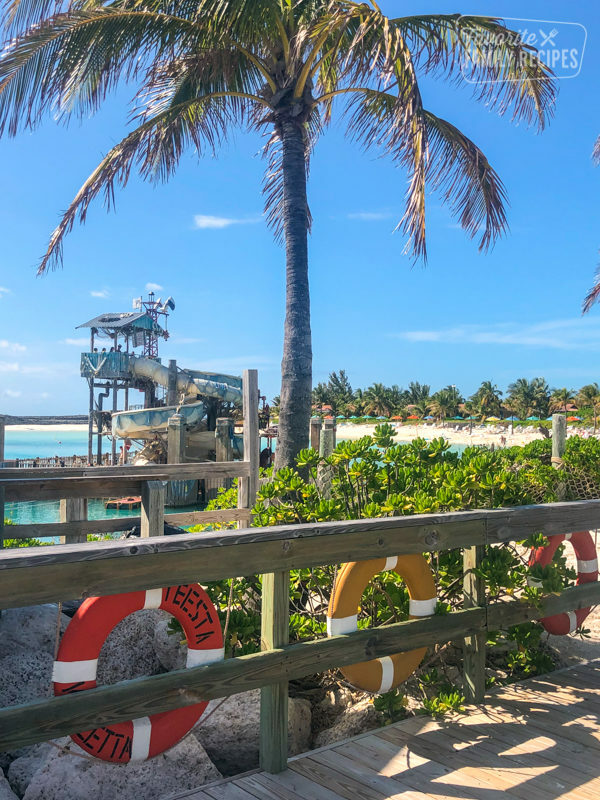 If you want to escape the crowds and get some AMAZING photo ops on Castaway Cay! All you have to do is come early and stay late. The first and last hours on the island are the least crowded (by far). Get off the ship as soon as they allow passengers off. The morning lighting is beautiful for pictures and the water is crystal clear because people aren’t playing in the water yet. Grab a nice, shady spot on the beach, and throw down your stuff to secure it. The spots furthest from the ship fill up first so head that direction. Possibly even better than getting there early is straying there late. A lot of people head back to the ship around 2-3 because they are done with the sun and sand but that is the best time to be on the island! We spent the last hour of the day at Serenity Bay and pretty much had the place to ourselves. It was incredible! We got some of our very best pictures at this time. See the video below to see how EMPTY is was. We took this video around 3pm. Snorkeling- Snorkeling in the Castaway Cay Lagoon is a must! Not only will you see all sorts of fish on your adventure, you will see a bunch of underwater statues and sculptures. 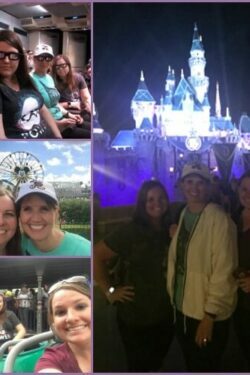 See if you can find Mickey! If you are looking for more adventurous snorkeling out on a reef, you can book a snorkeling tour that takes you outside of the lagoon. They will take you out on a boat to a beautiful living reef that is teeming with sea life. Bicycle Rentals– Biking the island is the way to go if you want to want to see a lot of the island in a small amount of time. A one-hour rental is more than enough to explore and bike up to the observation point. At the observation point, you will have breathtaking views of the island. You won’t want to miss it! Tip: If you bike, do it first thing in the day because it gets hot fast. Get a good bike ride in first and then spend the rest of the day on the beach cooling off. Inflatable tubes- The ultimate way to relax in the water! Plus, the kids have a blast on these things. “The Getaway Package”– Can’t decide which of the three things above you want to do? You don’t have to because you can do ALL THREE for a reduced price! 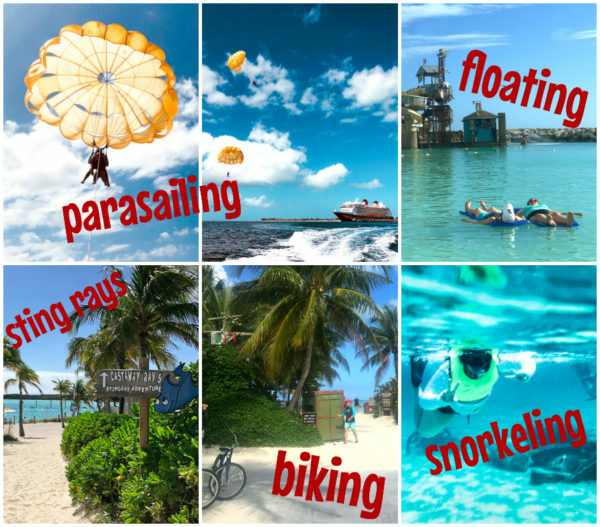 Snorkel, bike AND tube for a full and exciting day at Castaway Cay! Parasailing– A fun, thrilling excursion that will also give you incredible views of the island. It will be an experience you will never forget! Glass bottom boat– Love seeing the sea life but don’t enjoy snorkeling? Have kids that are too young to snorkel but would love to see all the fish? Give the glass bottom boat a try! This is a great option when you want to do an excursion or escape to Serenity Bay (the 18+ beach) for a couple hours, kid-free. It is open from 8:30-4:00 and you can have them there as much or as little as you want. My kids LOVE the kids club on the island! They build sand castles, play water games, search for buried trinkets and SO much more. The play area is huge and the kids are free to explore and play as much as they would like. Lunch is served to the kids in Scuttles Cove around noon so if you are out on an excursion or just enjoying your alone time you won’t need to worry about getting back to feed them. They will get a variety of choices much like the ones you would get at Cookies BBQ or Cookies Too. Cabanas are the very first thing to get booked. 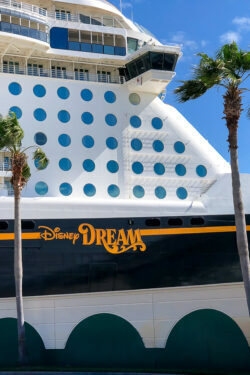 In fact, if this is your first time on a Disney Cruise your chances of being able to get one are pretty slim. The more you cruise, the sooner you can book the cabanas (or any excursion). They are a little pricey but in my opinion they are totally worth the cost if you are just wanting to spend the day on the beach. 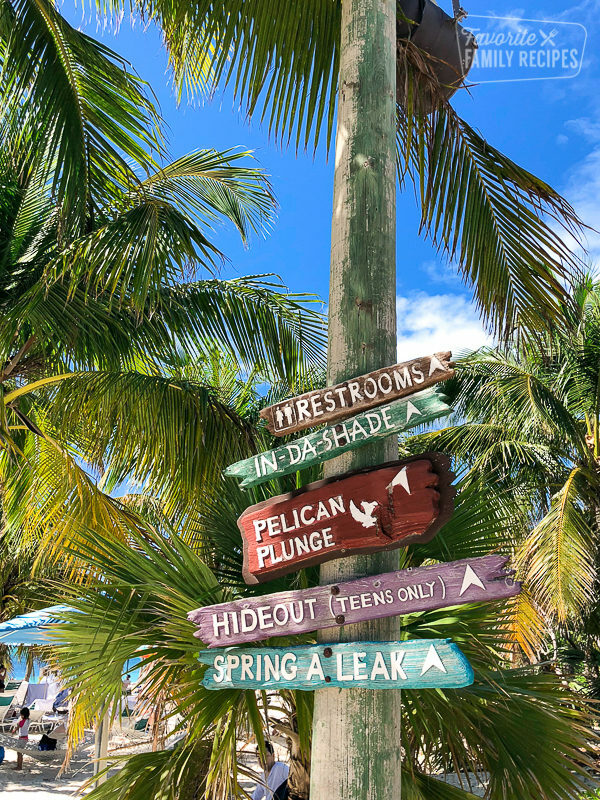 What is included in a Castaway Cay Cabana? 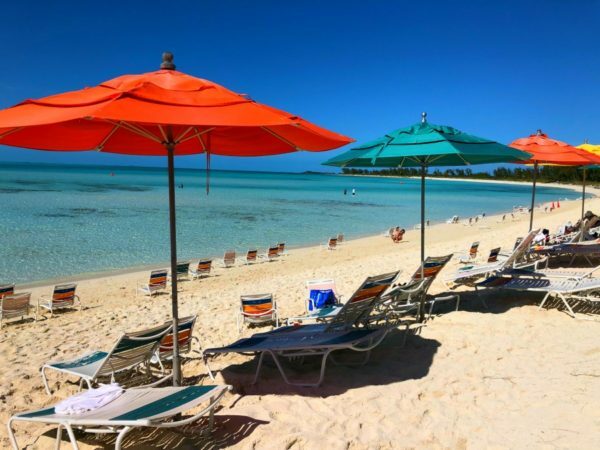 Your own private corner of Castaway Cay- Those who book cabanas have their own private, uncrowded beach. This stretch of beach is much more calm and quiet. Each cabana has their own large portion of beach where you can easily spread out and play with no overlap from anyone else. Luxury shelter- Get up out of the sand but stay on the beach! You will be sheltered from the sun and possible rain. You can close the shutter doors for added privacy and there is even a sliding curtain you can pull closed if you need to change. This is also perfect if you have very small kids who need a nap during the day. They can nap in quiet and comfort while you relax on the beach a short ear-shot away. Relax in style- Each cabana has its own sofa and padded beach chairs! You even get your own private hammock you can swing in all day. Cabana Concierge- Get cabana-side service at the push of a button. Get drink or snack refills, extra towels, or even golf-cart rides to other parts of the island. Equipment is included- Everything in the “Getaway Package” above is INCLUDED! You will get bikes, tubes, and snorkel gear for each person in your party. That right there is worth half of your cabana cost! Your little kids will even get sand toys they can play with right there on the beach (no need to buy any). Sunscreen- Forgot your sunscreen on the ship? No problem. Each cabana comes stocked with sunscreen so you don’t have to worry about anyone in your party getting toasted by that bright, tropical sun. Drinks and Snacks- You will get unlimited cold water and sodas all day long. Plus when you arrive you will find snacks and a full bowl of fruit. You won’t ever have to leave your cabana if you won’t want to! Most of the souvenirs on Castaway Cay are exclusive to the island. If you see something you like, GET IT! Trust me, this will be your only chance. 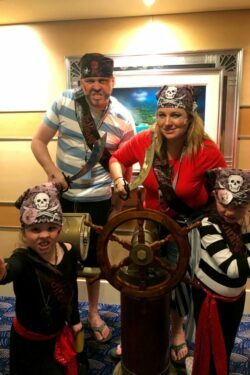 We found some awesome t-shirts, hats, swim cover-ups, and pins that are all exclusive to Castaway Cay. I would also recommend getting your souvenirs early-on before they get picked over. Oh, and don’t want to carry them around all day? Just let the cast member in the shop know and they DELIVER THEM to your stateroom for you! 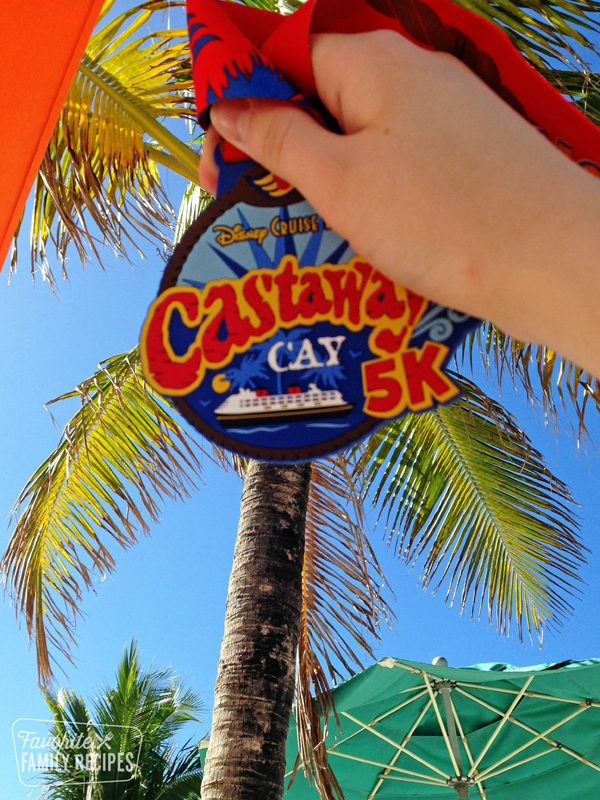 Run the Castaway Cay 5k! It’s free and you will have a chance to grab a towel and stake out a spot on Family Beach before others are even allowed off the ship. 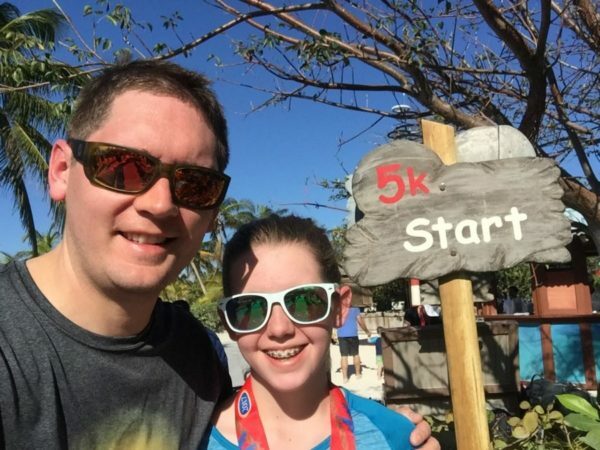 If you have a family member not old enough to run (you have to be 10+), no worries, they open Scuttle’s Cove early for the runners so you can drop the kiddos off and enjoy your run! Not a runner? Many people walk it. It’s a great way to check out the island without the crowds! Plus, you get a bib and a cool Castaway Cay medal just for finishing. Win-win. Check your daily navigator in your stateroom or check the navigator app while you are still on the ship. 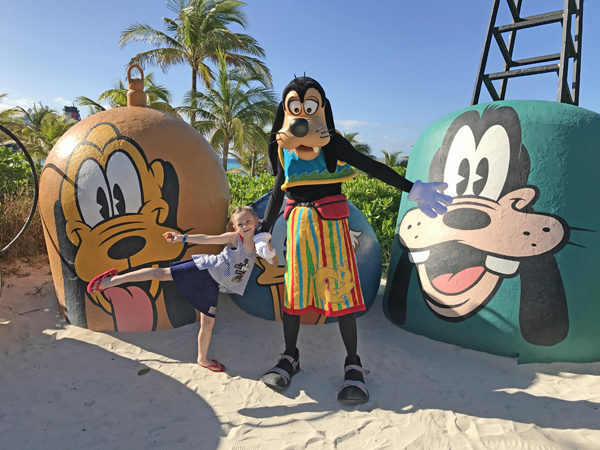 You will want to jot down the character times as you won’t have wifi on Castaway Cay. You can write the times in a note app in your phone, take a screenshot, or take a picture of your paper navigator if you don’t want to carry it around on the island. 10. Eat on the island for free! 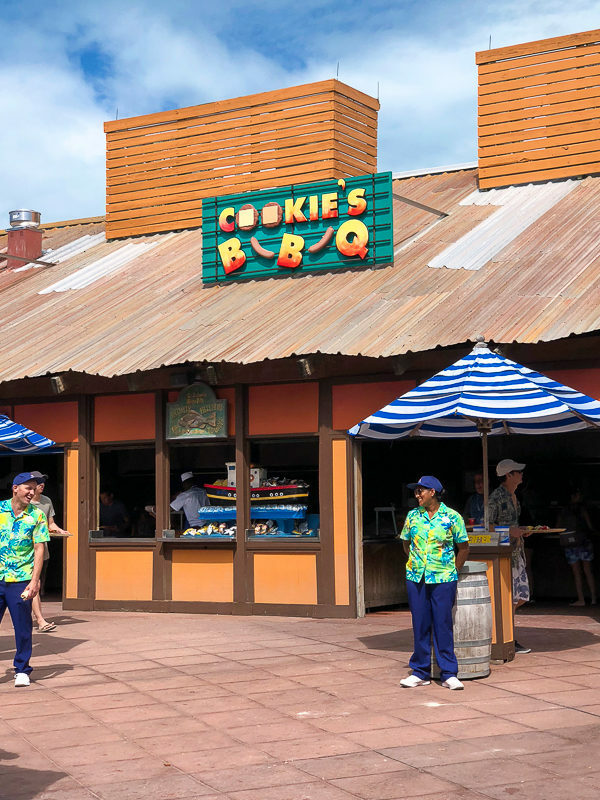 There are three restaurants on the island: Cookies BBQ, Cookies Too, and Serenity Bay (Adult Beach) BBQ. All of the restaurants are open from 11:30am-2:00pm, but you can get drinks and ice cream ALL DAY. All of the restaurants serve the same delicious items. You will find grilled fish, chicken, burgers, hot dogs, and all sorts of delicious side dishes at all of the restaurants. The only difference is that they serve steak (ribeye) at the Serenity Bay BBQ so if you are needing a steak fix, it may be worth it to head up to Serenity Bay. 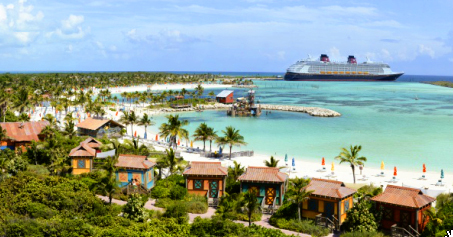 Did you know that there are cruises that do back-to-back stops at Castaway Cay? Totally worth it in my opinion. 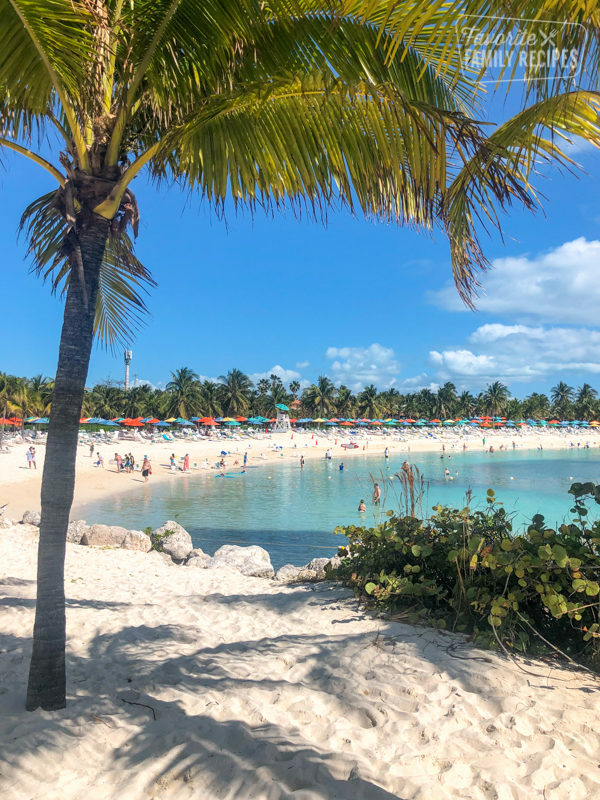 If you simply just can’t get enough of Castaway Cay or if you want to try ALL THE THINGS on the island- this is the cruise for you! 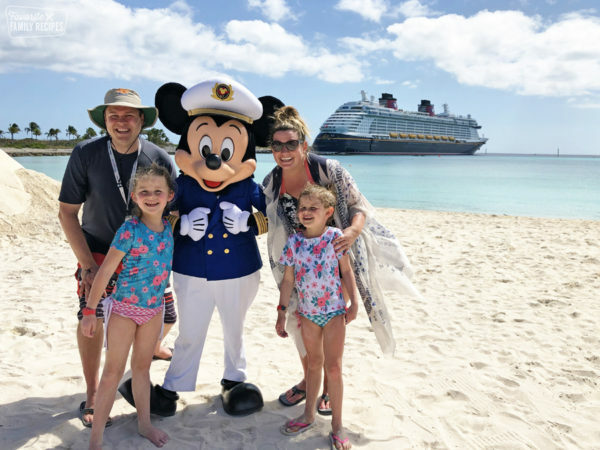 Disclosure: Though our experiences on Castaway Cay were generously provided to us by Disney, all opinions are our own. 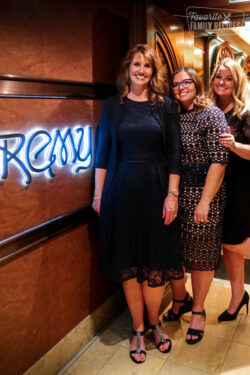 We have shared our true and honest opinions about our time there and we are excited to share them with you!